It's been a long road for Hemel Stags. When they lost 38-nil to Walthamstow side McEntee on the 5th April 1981 wearing a borrowed amber and blue Leeds-style kit, it lit the touchpaper on one of Rugby League's most enduring odysseys. On a journey that's taken in the Second Division of the South Amateur Rugby League, the London League, MASWARLA, the RL Alliance (playing other teams' 'A' Teams) and National Conference Leagues, they ended their time as a Conference side winning last year's NCL League 3 Grand Final at Featherstone 17-10 against Underbank. But don't be fooled into thinking this is Hornets' first clash with Hemel. Back in 1991 Hornets 'A' Team played the stags down at Pennine Way - TLCRF0mins was one of half a dozen tragics who made the trip (Hornets won and the team, coached by Kev Lowe bought US a drink!) With us that day were Dr Dave, Pugwash and Silent Don, so it's good to renew acquaintances after such a long break. As RL anoraks TLCRF80mins has seen a lot of Hemel over the last few years in our adventures in the Summer Conference (now NCL 3) - mostly in some bruising encounters with Underbank or Warrington Wizards. Coach Troy Perkins has always played to his team's strengths. Last year in NCL 3 Hemel were a bit of a blunt instrument - a massive pack supplemented by an equally huge backline that bludgeoned its way to the top of the pile. We wrote at the time that the NCL 3 final was the ultimate test of brains v brawn (Underbank having the advanage on craft, Hemel just bloody massive). Brawn won in juggernaut style. This year, the brains/brawn equation seems to have been balanced by the addition of MIke Bishay, Mason Caton-Brown, Shane Grady and Dan Sarginson on Dual Reg from the Broncos, and the shrewd signings of Austin Aggrey and Jermain Coleman who've always caused us lots of problems at former club London Skolars. Indeed, Hemel have had an impressive start to life in the semi-pro ranks. Currently sitting second in the table with four wins from six games, they battered South Wales Scorpions by 52 to 24 last week. As a benchmark, they lost 30-12 to Oldham the week before. Finally, don't forget that Sunday's game is the first ever clash of two supporter-owned Rugby League Co-Operatives at (semi)pro level in the UK (and, possibly, the world) and forms the centrepiece of a day of co-operation in the home of co-operation. In a great initiative to maximise Sunday's attendance, Hornets are offering admission for just two quid - all you have to do is print out and bring the voucher below. Do it - and bring a friend. Download the voucher today - and a dozen for your friends! If half time is where good coaches prove their worth, then Ian Talbot revealed himself as a master motivator at a sun-soaked Prince of Wales Stadium. Having seen his charges rack up an 18-nil lead in just 20 minutes, the anticipated landslide came to a grinding halt as Hornets sat back to admire their handiwork, allowing an enthusiastic All Golds back into the game. After a sluggish start in the Cheltenham sun, Hornets clicked after 13 minutes as Jordan Case grabbed a rapid-fire double: first supporting a Carl Forster charge, secondly off a tidy Danny Yates pass after Hornets had piggy-backed upfield on the back of consecutive penalties. Gaz Langley converting two-from two. And when Chris Hough released a 40/20 on 19 minutes, Hornets capitalised with Yates and Danny Davies combining to create space for Gaz Langley to score out wide. Langley slammed home the extras from the touchline on his way to a 100% nine-from-nine and an impressive personal haul of 22 points. With Hornets now in total control, the game looked to be heading in only one direction, but a lackadaisical last 10 minutes of the half gave the home side all the encouragement they needed to play some enterprising football and grab a foothold in the game. Running prop Tyla Hepi at Danny Yates out wide paid dividends, as a succession of second-phase plays drove Hornets backwards. On 29 minutes a Bradley kick was uncharacteristically fumbled under pressure by Wayme English and after some sustained pressure the All Golds worked Crowther through some indifferent defence by the posts. Bradley converted. Within five minutes the home side had set-up camp in the Hornets 10 metre zone and it was Bradley's turn to grab a well-taken try off a well-timed Smith pass. Bradley hoofed the conversion attempt wide and low, but at 18-10 the home team's momentum was only broken by the half-time hooter. It's fair to say that Ian Talbot wasn't happy in the sheds at the break. Having used the time to reiterate the importance of hard-work and of adhering to the game-plan, he sent out a reinvigorated, more determined Hornets. Within five minutes Hornets had grabbed the game by the scruff. Playing at a palpably higher tempo and wih greater intensity in the tackle, John Cookson's try after 45 minutes finally prised the game open. Four minutes later, Hornets created the try of the game: Mike Ratu's block-busting 50 metre break continued by Gaz Langley, his inside ball to Danny Davies who sucked in the All Golds full-back to send Steve Roper diving twixt the posts. Fantastic stuff. Langley added the extras. Next, Mike Ratu turned scorer, bustling and hustling his way through defenders, followed closely by Chris Hough ducking in from close range. With the home side visibly wilting in the heat, lively young half-back Danny Yates grabbed a couple for himself - the first the pick of the pair off a skittering Wayne English break that left the home defence chasing shadows. In the wash-up this was a comprehensive victory. It'd be churlish to complain too much about Hornets' 10-minute sabbatical at the end of the first half, but the intensity and fluidity of the second period showed what's possible when the boys play to their full-potential and don't let teams off the hook. And, having imposed the All Golds' heaviest league defeat so far, it's fair to say that it was a good afternoon's work. A mention too of the Hornets supporters who made up a decent proportion of the 250 present - a top effort from everyone. As for the All Golds, their set-up at Cheltenham is impressive and, with Lionel Hurst and Brad Hepi on board they have the depth of League expertise they need build a club that 'grows in the community' rather than just bussing-in an Oldham side every other week as they have down the road at Oxford. Hurst and Hepi are building from the ground-up and, with a trip equal to either of the West Cumbria clubs (and a town steeped in RL heritage), there's great potential for League to put down solid foundations here in the heart of *nion country. We're nothing if not dilligent here at TLCRF80mins Towers and we pride ourselves on unearthing all the lovely interesting nuggets about Hornets' forthcoming opponents. 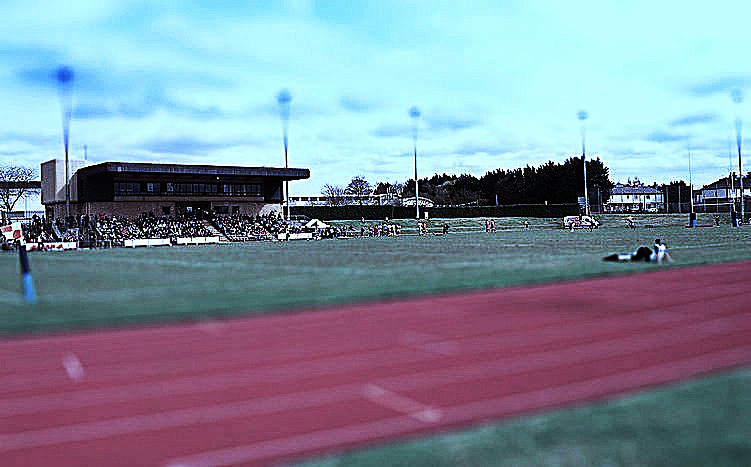 But finding detailed information of the University of Gloucestershire All Golds (or, as we call them, 'UOGAG') has proven a sterling test of our detective skills. The 'This Is Gloucestershire' website was our first port of call. 'Rugby League' isn't listed amongst the sports it covers and when you click the generic 'Rugby' link you get swamped with articles on the code preferred by chinless, tweed-wearing tractor jockeys and their forelock-tugging yokel henchmen. 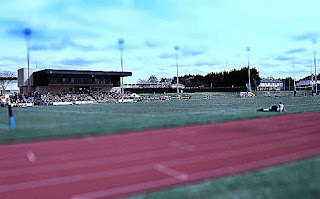 All Golds - ooh, an athletics track. Bring your binoculars. So we clicked through the 'other sports' link to a header that says "Grassroot sports - latest news in Gloucestershire including skittles, hockey, darts, rowing, netball, basketball, youth sports, equestrian, swimming, boxing and martial arts". The page carries an in-depth feature on Gloucester Lions Korfball team. So far, so bad. So a search of the news site for "All Golds" seemed like a banker to grab the latest news. Lurking below articles on a Children's 9s tournament, an update on Gloucester Warriors in the Conference South West and the formation of a new club Cheltenham Old Pats, we finally bumped into a report on the All Golds' defeat at Gateshead - that didn't actually give you the score. Thankfully, Gateshead seem to have their act together and report that they beat the All Golds by a comfortable 30 to 10 in front of 160 people. Yes, that's right - one hundred and sixty. Great. Then, off we headed to The Gloucestershire Echo, where the picture was much the same, where the All Golds got fourth billing on a page found by searching for 'All Golds'. Needless to say, we learned nothing new. The experience was repeated at the Gloucester Citizen, where any reference to 'Rugby' was repaid with some pan-faced knuckle-draggers yawning on about the other code's World Cup. What we do know is that UOGAG are coached by peripatetic former NZ Maori rake Brad Hepi, who recently felt compelled to pull on his boots at the age of 45 to give the All Golds a bit of guidance and steel in the middle of the park. But his comeback was brought to a shuddering halt when he dislocated his shoulder at Skirlaugh in the Challenge Cup. The vast majority of the All Golds squad have been promoted from their successful student side, augmented by the addition of a few 'ex-pat' pros, including Tim Bergin (ex-Sheffield), Tyla Hepi (ex-Hull KR), Richard Jones and Chris Clough (both ex-Keighley), Jordan Rice (ex-York), Jamie Crowther (ex-Doncaster) and ex-Toulouse threequarter Maxime Claustres. So what do we know about UOGAG? Well they're rock bottom of KPC1 with no wins from four, shipping an average of 34 points a game and scoring an average of 12. Though they did lose to Oxford by 30 points to 40 - so they're not exactly at home to Mr Defence. As a benchmark, Oldham whacked them 36 to nil last month at the Prince of Wales Stadium, so Hornets need to get their ruthless head on and go at 'em from the first whistle. Take the M6 (S) to Birmingham. At junction 8, exit onto M5 toward Birmingham (W & S)/West Bromwich. At junction 10, exit onto Writhy Bridge/A4019 toward Cheltenham. Continue to follow A4019 Go through 1 roundabout. Turn right onto Swindon Rd. At the roundabout, take the 1st exit onto St. Paul's Rd. Turn left onto Folly Lane. Continue onto Tommy Taylor's Lane. Estimated driving time 2 and a half hours (so no worse than, say, Whitehaven).